Play time doesn't need to mean rough housing. Rough housing can be cute behavior in a puppy, but the bigger he gets, the less fun it is. The problem, of course, is that your dog doesn't realize you aren't having fun. Fortunately, dogs that like to rough house typically like other games as well, and can be redirected. Walk your dog several times a day. Walks are an important way to exercise your dog because they provide structured activity. Not only is he getting exercise, but he is listening to and paying attention to you. Dedicate time each day to unstructured play. This can be fetch, hide and seek or any other games your dog likes to play. Be cautious about games such as tug of war, which may escalate into rough housing if you are not careful. Train your dog to understand basic obedience commands or teach him tricks such as rolling over or shaking hands. These activities stimulate his mind and help him focus on listening. Redirect your dog when he starts to rough house. Like any other habit, it will take a while for your dog to learn he is not allowed to rough house. Once he starts, do not engage him, gently shove him away, say no firmly and walk away yourself. Yelling or swatting at him will only excite him further. 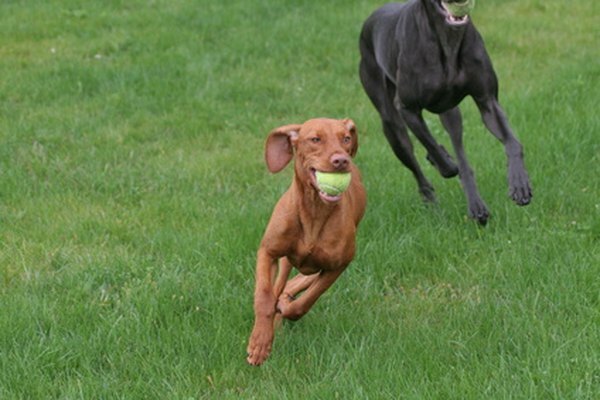 Even dogs that have access to a fenced yard need additional exercise. Left to their own devices, many dogs will not exercise themselves enough to remain calm when stimulated by their owners or company. Are Cats' Tongues Supposed to Be Bumpy?